This thesis describes a systematic and phylogenetic analysis of the genus Cichorium. Cichorium is a small genus within the Asteraceae family (tribe Lactuceae) and is well known because of its two widely cultivated species: C. endivia (endive) and C. intybus (chicory). The genus occurs in the Old World and has been introduced in temperate and semi-arid regions elsewhere. An important diagnostic character at the genus and species level is the unique structure of the pappus, which, at the same time, causes difficulties regarding the relationship of Cichorium with other Lactuceae genera because of the unknown homology of it with other pappus structures. From a morphological point of view the genus is thus rather isolated. Our molecular phylogenetic analyses based on chloroplast (RFLP and sequence data) and nuclear ribosomal (ITS sequence data) DNA of Cichorium and nine other genera ( Agoseris, Catananche, Chondrilla, Lactuca, Microseris, Prenanthes, Scolymus, Scorzonera and Taraxacum) confirm the isolated position of Cichorium within the Lactuceae. Besides the two cultivated species C. endivia and C. intybus, four wild species are recognised here: C. pumilum, C. calvum, C. bottae, and C. spinosum. The latter two species are easily distinguished by their cushionlike growth form and spiny terminal branches, respectively. The remaining two wild species are morphologically very similar to the two cultivated species C. endivia and C. intybus, because they differ primarily in quantitative features. However, in a multivariate analysis of morphological characters the species do not extensively overlap. The most important morphological character for species delimitation is the pappus, but the differences in life span and reproductive system help to distinguish C. intybus (selfincompatible perennial) from C. endivia, C. pumilum, and C. calvum (all selfcompatible annuals). The results of the phylogenetic analysis of Cichorium based on both chloroplast and nuclear ribosomal DNA agree with the genetic relationships among the species determined with AFLP markers. 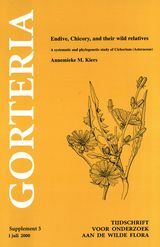 The most important results are (1) C. bottae is sister to the remaining Cichorium species, (2) C. spinosum is the closest relative of C. intybus, and (3) C. endivia is sister to C. pumilum and C. calvum in the chloroplast based phylogeny, but the relationships among these three species are unresolved in the phylogeny based on nuclear ribosomal DNA. Based on the congruence between phylogenetic and genetic analysis, unique markers were expected for all species. Surprisingly, species-specific markers are nearly absent except for C. bottae which proved to have seven unique markers. Apart from that, a single speciesspecific marker has been found for C. endivia and one diagnostic marker has been found for C. intybus and C. spinosum together, confirming their close relationship. In addition to the species analysis, the genetic relationships among the cultivar groups of C. intybus (Root Chicory Group, Witloof Group, Pain de Sucre Group, and Radicchio Group) and C. endivia (Scarole Group, Frise Group, and Endivia Group) are established using AFLP markers. The analysis of C. intybus cultivar groups resembles the species analysis in two respects: (1) grouping of cultivars according to cultivar groups, and (2) lack of markers unique to cultivar groups. In contrast to C. intybus, the cultivar groups of C. endivia do not form distinct groups, which reflects that crosses have been made among the various cultivar groups. The relationships among Cichorium species and cultivars will be useful for setting up a core genebank collection of Cichorium. The importance of inclusion of the wild species in such a collection is emphasised. Despite the high morphological resemblance of C. endivia and C. intybus, all three DNA-based analytical methods (chloroplast and nuclear DNA based phylogenetic analysis and the multivariate analysis based on AFLP markers) do not support a close relation between the two. The wild progenitor of C. endivia remains uncertain. It is usually suggested that C. pumilum is C. endivia’s wild progenitor, but also the poorly known species C. calvum should be taken into consideration. As yet the proper phylogenetic relationships between the three species is not clear. Finally it is concluded that genetically modified organisms of both C. intybus and C. endivia have very high Dpdf-codes, which means that field experiments with genetically modified endive and chicory plants are to be treated with great caution.